These weevils were abundant and all over everything, including milkweed. 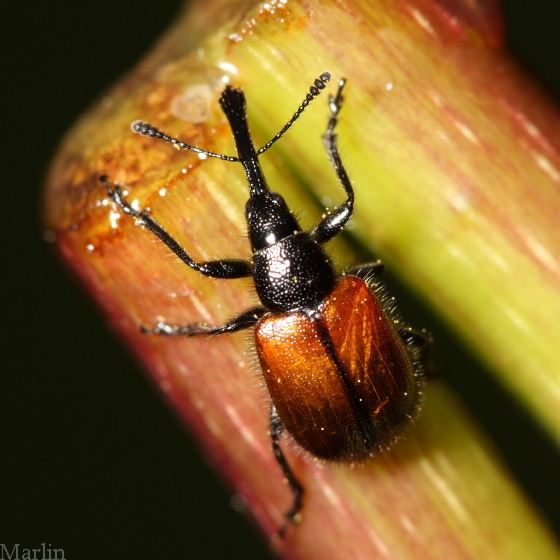 I now find they are commonly called "sunflower head-clipping" weevil. I did find them primarily on plants in the sunflower family. This species is correctly identifies. Note that the specimen is teneral and lacks the normal al;l black color of mature individuals. This is a fully mature adult. Now I see the category, I have to comment - all the plants this weevil was infesting had their heads clipped. It's amazing this insect causes such a specific damage. And, speaking of which, the stem in the picture has been clipped.